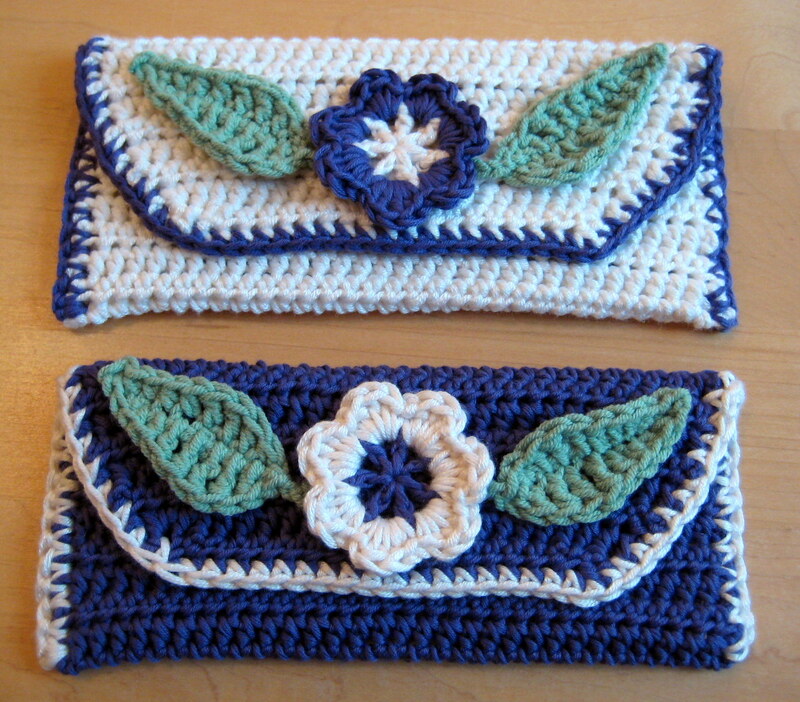 If you like the metallic clutch bag I use as my profile picture, these little purses are similar. These were made specifically to fit US dollars, gifts for my friend’s girls who recently emigrated stateside. I love how a simple flower can pretty up these items. 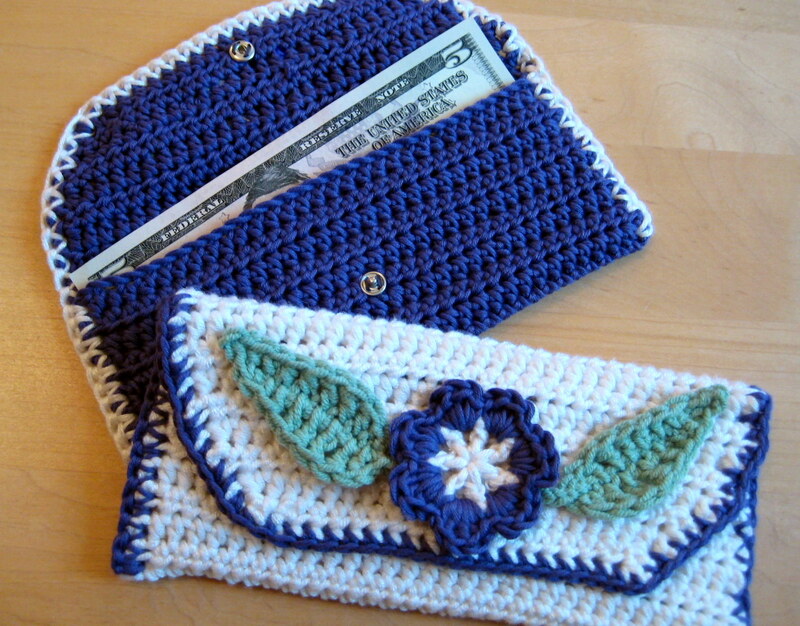 These purses are dead easy to make, so perfect for a beginner or expert looking to make a quick gift. You will need three colours of yarn (one green for the leaves) in dk (around 50m of main colour) and a 4.00mm hook. You may also like to add a popper for a fastening as I did. Tip: Measure your chain length to ensure it is long enough for your desired purse size. Rather than worrying about gauge, just chain a few more or less (you can amend the st count as needed). Repeat row 2 until the work is twice the height of a dollar bill (or desired height), the repeat 2 more times. Fold the piece so that the compartment is the desired height. Join the contrast colour yarn to the bottom left hand corner by inserting the hook through both layers and drawing up a loop. Now work 1sc per row (or as evenly as you can) through both layers up the side to join them together. Continue around the flap of the bag, working 2- 3 sc into the corners of the flap (depending on your tension). When you reach the sides, sc through both layers to join together as on the opposite side. 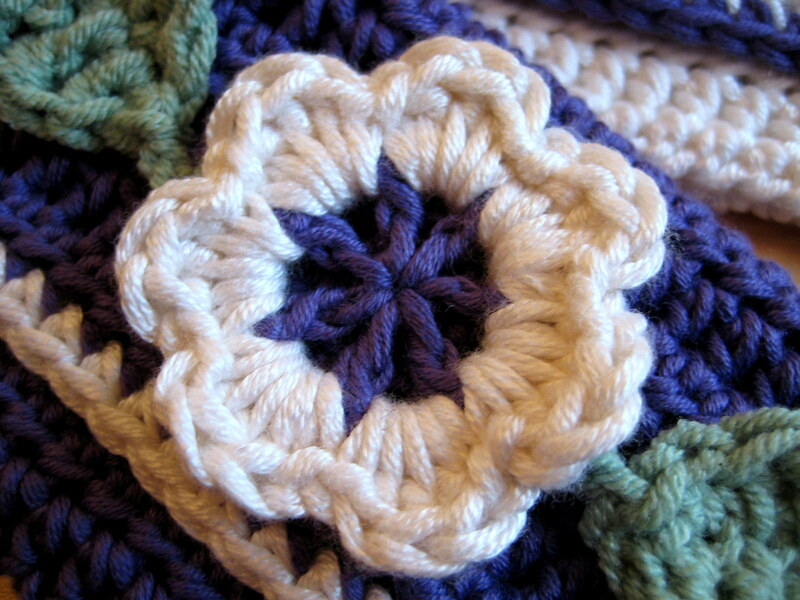 I used the first 2 rounds of my Triple Layer Flower pattern. If you have made a larger size purse, just add the next layer or 3 layers of petals (as per my metallic clutch bag). Make the point of the leaf by making a ch3, sl-st into 3rd ch from hook. Rotate the leaf to work back down the other side of the chain. R2: sc, sc, hdc, dc, htr, tr, htr, dc, ch2 and close the leaf by doing a sl-st into the last ch just worked. Ch3 (or more) to make a stalk, fasten off leaving a long tail to sew the leaf onto the work. 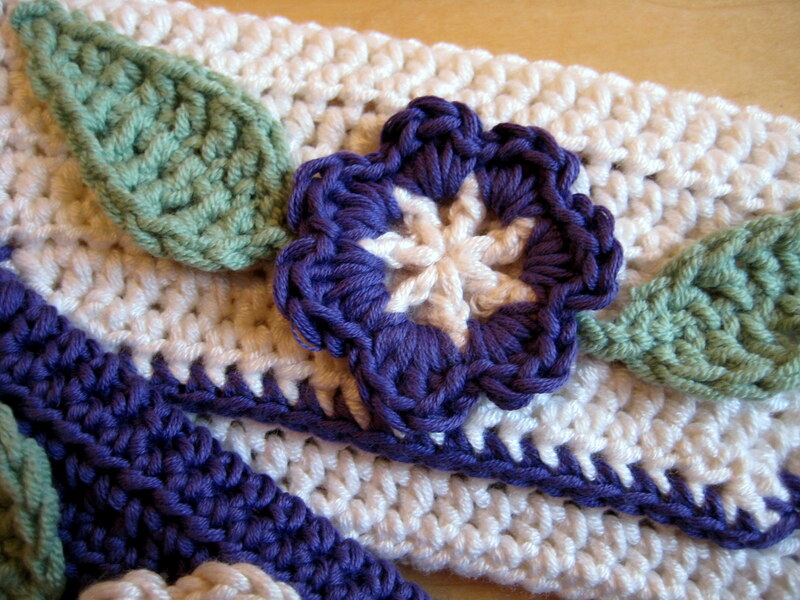 To finish the bag, sew your flower and leaves onto the flap. Sew your popper (or fastening of choice) into place. I did not block these as I wanted them to remain stiffer, but you can block if you prefer. Why not experiment by adding more flowers or placing them off centre? 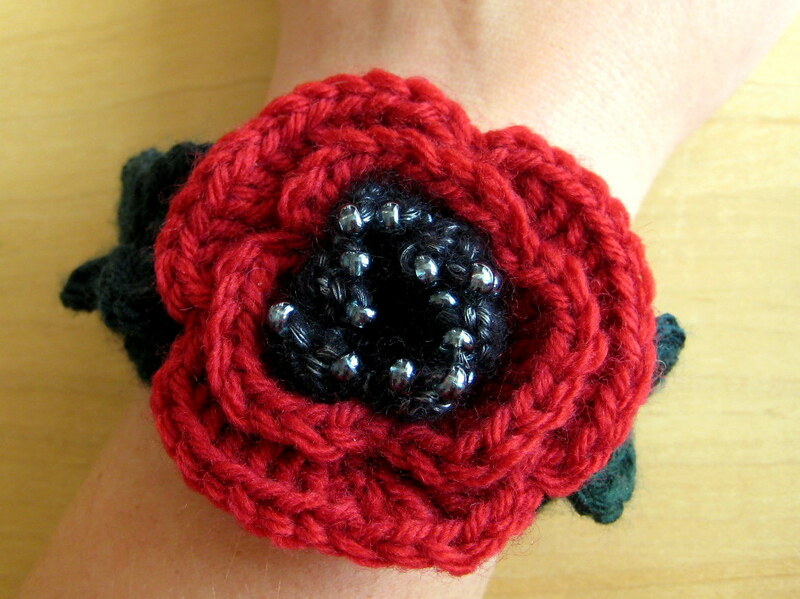 If you like this pattern, why not check out my Beaded Poppy Bracelet? 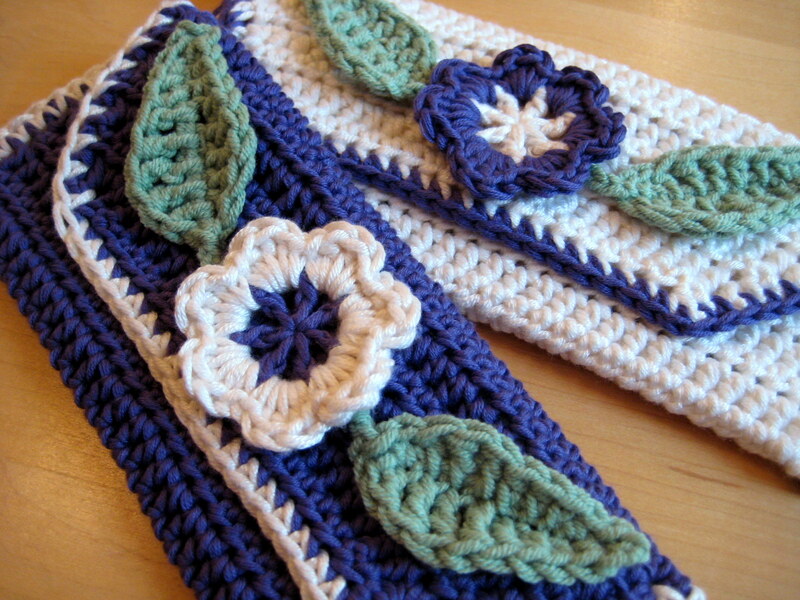 This is a great pattern to challenge yourself with if you are a beginner because it includes lots of step by step photos to make it easy, and the resulting bracelet or brooch has a lot of impact. I am selling this pattern to raise money for the Royal British Legion. Here in the US, we don’t wear poppies or any flower for our Veterans Day (11 November). We just wear a small American flag pin.